Thomas Tuchel made it clear. He wants to win the Europa League. Dortmund starting eleven was undoubtedly the strongest he could have picked, given injuries and illnesses. After 355 days, Nuri Şahin returned not only to the squad, but also to the starting line-up. The 27-year-old played alongside Julian Weigl in what was a 4-2-3-1 formation. Shinji Kagawa once again got a chance to prove that he is valuable, even though he hasn’t recently delivered good performances. Porto’s head coach José Peseiro surprised with a few decisions regarding his starting eleven. Attacking playmaker André André was benched as well as right-winger Jesús Corona. Due to various injuries, Peseiro had to find an improvised solution at the back, as he fielded Miguel Layún, who is actually a full-back, as centre-back and Silvestre Varela, who usually plays in attacking midfield, as right-back. Moreover, Peseiro changed the formation from a 4-2-3-1 to a 4-3-3/4-5-1 hybrid. Therefore, the Dragões applied a man-marking scheme in midfield. Héctor Herrera was asked to cover Şahin, while Sérgio Oliveira watched Weigl. Since both wingers man-marked Dortmund’s full-backs as well, they often had to sit deeper than said central-midfielders. Especially right-winger Moussa Marega was more or less a second right-back due to the fact that Marcel Schmelzer immediately pushed forward when Dortmund begun to build up their attacking plays. Overall, Porto’s 4-5-1 defence aimed at narrowing the gaps at the offside-line paired with a tendency towards backtracking fairly quickly as soon as Dortmund found their passing flow in the build-up plays. Even after Dortmund having scored the go-ahead goal, as Łukasz Piszczek tried to tip in the ball following a cross-pass, and Iker Casillas denied his shot but couldn’t stop him from converting the rebound, Porto didn’t change their mind at all. Until the end of the first half, they stuck to their defensive strategy, including pointless long balls towards Vincent Aboubakar, who had no chance to play lay-off passes due to the lack of support up-front. Dortmund could easily cover Porto’s centre-forward, surrounding him with two or even three defenders at the own back-line. As mentioned, when Dortmund were building up, Schmelzer immediately advanced, giving Marco Reus the opportunity to roam around in the left half-space. Right-back Piszczek, however, stayed near the centre-backs at first, with Weigl offering a short passing option in the right half-space, when Yacine Brahimi pressured Piszczek. Meanwhile, Şahin often dropped back between Sokratis and Mats Hummels, so that the latter moved towards the side-line, creating some sort of a back four, while out-numbering Porto’s first pressing block. Or more precisely, Herrera and Oliveira stopped chasing Şahin and Weigl, when both Dortmund midfielders moved back and stretched the zones. 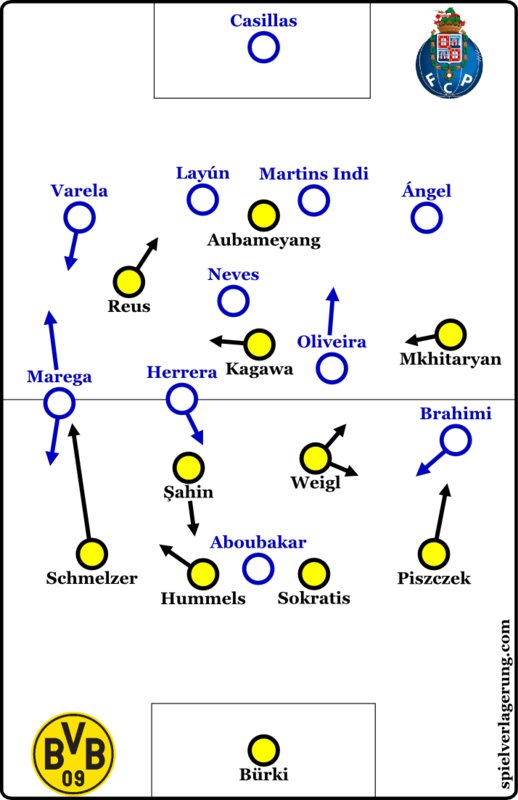 Due to Şahin’s presence in the middle, Dortmund could use more diagonal passing patterns and involved both Hummels and Piszczek relatively easily – which was also down to the fact that Porto couldn’t shout down diagonal passing lanes because of their passive behaviour on that side of the ball. Moreover, as Dortmund mainly focussed on the left-side, when building up, Piszczek time and again was able to steal away from Brahimi who then couldn’t intercept passes that targeted the Polish full-back. Defensively, Dortmund applied a 4-4-2 pressing, with Reus usually defending alongside Pierre-Emerick Aubameyang in the first level of defence. Normally, both players covered the zone in which Porto’s deep-lying midfielder – Oliveira or Rúben Neves – was positioned, while Dortmund didn’t fear possible runs by one of the opposing centre-backs. At times, Neves moved back through the left half-space to help Layún and Bruno Martins Indi, but couldn’t link up with his team-mates in midfield as a result of Dortmund’s defensive scheme and caused by the lack of movement up-front. Plus, Porto spread out both wingers, which didn’t help to provide connections in the build-up of plays. As for Porto, their defensive-minded approach led them nowhere. Around the 25th minute, they for once used a high press, attacking Dortmund’s playmaker in opposing territory, and directly made BVB struggle to move the ball forward. Until the break, they remained in a state of impuissance and reactivity. Fortunately for them, Dortmund lost a step throughout the last 20 minutes of the first half, which led to a greater amount of isolated wing-attacks and ultimately to a lack of shots on target. Peseiro adjusted Porto’s system slightly, with Oliveira now man-marking Kagawa more strictly and both wingers being positioned higher up the pitch in the first phase of pressing. After 55 minutes, the guests started to move their midfield block forward, applying more pressure based on how they narrowed the zones in front of Dortmund’s back-line, which automatically improved their counter-pressing intensity. Plus, Porto intended to stretch the field with a deep back-line and more players up-front. As a consequence, the Dragões had to take higher risks, as they let back-field zones open. Yet, Dortmund struggled to play accurate passes to Reus and Aubameyang thanks to Porto’s counter-pressing in that phase of the match. Dortmund reacted with longer spells of ball possession around the hour mark. Meanwhile, Moritz Leitner replaced Şahin, and assumed his role. Like Şahin, he moved through the left half-space, occasionally picking up balls at the back-line, but had to deal with a more aggressively defending opponent in Herrera. In Dortmund’s 3-2 build-up shape, Leitner dribbled towards the Mexican quite often, yet he couldn’t find an open man before running into Herrera. It appeared as a more effective strategy when Hummels played the initial pass to Leitner who could attempt to sneak past Herrera before receiving the ball. In the 71st minute, Porto’s situation got worse, as Dortmund scored their second goal. Hummels almost lost the ball in the process, but the hosts were able to re-gain possession. The ball then reached Schmelzer who headed to Kagawa. The small Japanese protected the ball at the edge of the penalty box despite being out-numbered. His cross-pass to the right side found Mkhitaryan who directly played a cut-back pass to Reus. The 26-year-old hit the back of the net thanks to a deflection. Porto made desperate efforts to intensify their offensive pressure in the last few minutes of the game. Yet, the degree of collective compactness diminished when turning the ball over. Dortmund couldn’t capitalize on it, however. Peseiro showed no intention to turn the match into an open battle. Porto travelled to Dortmund with only one strategy in mind: keeping the score as low as possible. However, this season has shown that BVB can deal with deep sitting sides far better than with teams who apply a high press and use close man-marking in the middle of the park. With Şahin being back and looking as sharp as it gets, Tuchel has also more option in terms of how he adapts their system to respective opponents. İlkay Gündoğan’s absence in that match was of no consequence. And that tells you a lot. bitte fügt unbedingt auf Eurer deutschen Seite Links für die englischen Artikel ein. Ich habe nach einem Bericht zu diesem Spiel gesucht, und bin dann nur über die Kommentare der Bundesliga Vorschau hierher gekommen.